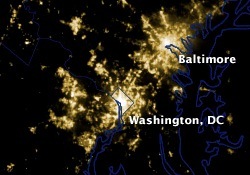 Via NASA come pictures that show how severe the power outages were in the DC area during the aftermath of last Friday’s derecho storm. The slider effect is devastating, and shows whole large swaths of Northern Virginia and the Maryland suburbs that were in the dark in their entirety. The core of DC stays largely lit, thanks to its network of underground power conduit.